The rubric for the convention this year is "Envisioning a More Perfect Union: Building the Beloved Community"
The convention, an annual Islamic event held at the end of the summer and regularly hosting dozens of (this year, 200) invited speakers, as well as musical entertainment, art and photography exhibitions as well as 'meet the author' events - and concentrated around a bazaar of artists, businesses and trade exhibitions. 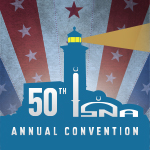 ISNA is an association of Muslim organizations and individuals that provides a common platform for presenting Islam, supporting Muslim communities, developing educational, social and outreach programs and fostering good relations with other religious communities, and civic and service organizations. Invited speakers for this year include Hamza Yusuf, past ISNA President Ingrid Mattson, Jamal Badawi, Congressman Keith Ellison, online host Nouman Ali Khan, esteemed scholar Seyyed Hossein Nasr, Professor Sherman Jackson, Imam Siraj Wahhaj, Tariq Ramadan, Imam Yusuf Kavakci and Imam Zaid Shakir. Please type '354' into this field.